The capital city is not the only place where you can live well and emigration is not a salvation. These thoughts were expressed in the World Economic Forum's Youth Network Global SHAPE discussion "What can we do in the regions of Lithuania?" Adviser to the Lithuanian president Giedrė Kaminskaitė-Salters, who came back from Great Britain just month ago, said she envied those who had never left. According to her, the experience she gained abroad could be beneficial to Lithuania, but it is not a necessity. The head of "Civitta" Donatas Voveris gives a simple answer to the question why he has never left the country. Voveris claims that he feels very well in Lithuania. At 27, he is a manager at one of the biggest consulting companies. "The conditions for leisure and life quality are incredibly good," says Voveris. He says he can be an example of why it is worth staying in Lithuania. "I am the patriot and my heart is where I live. When a patriot leaves the country, what happens? Is the heart still here while you live elsewhere?" wonders the businessman. "TEO LT" CEO Kęstutis Šliužas agrees that the quality of life in Lithuania is excellent. "We cannot even complain about the number of flights from Vilnius," says Šliužas. He left the country and came back for professional matters. He claims that he has understood how good it is to give something to your country, not just take. Singer Jurgis Didžiulis has recently travelled around the regions of Lithuania with his project "Reanimation", during which he performs without pay and "reanimates" his work from dependence on money. The performer tries to refute the assumption that you need to earn a lot and spend a lot of money to lead a good life. When Didžiulis came to Lithuania at 20, he says he understood immediately that this is the community he can belong to. However, the performer has observed that people in the regions do not find any sense to create anything, because of low incomes. Even though there are some exceptions, a large part of people from small towns or villages do not think they can create a prosperous community without money. According to Didžiulis, "They do not appreciate themselves. It is very sad. They do not nurture relations, they want to go to the centre – Vilnius, London." Šliužas says that the situation in Lithuania's regions can be changed by good examples. "Do not envy your classmate who is living in the big city, there are activities and opportunities everywhere to do good work," says TEO LT CEO. The businessman Voveris agrees. "It is necessary to communicate that leaving is not a salvation. My colleague was invited with a school in a region. He came to me and said that he needed to leave Ignalina. It is necessary to change the message: I left, I live great, but I came back," says the head of "Civitta". Kaminskaitė-Salters recalls her own example. When she decided to came back to Lithuania, there were talks that if you come back from abroad, it means you failed there. According to her, it is necessary to change the view that success will reach only those who leave and do not came back. The presidential adviser suggests not to be ashamed of being Lithuanian. "Do not acquire fake accents, keep Lithuanian accents. I do not like when somebody leaves for a half-year and cannot make a sentence in Lithuanian," said Kaminskaitė-Salters in the discussion. Didžiulis says that in order to make people proud, the country needs a change of mentality. However, the performer added he understood the importance of financial security, because if one does not have bread, one cannot think of bigger things. 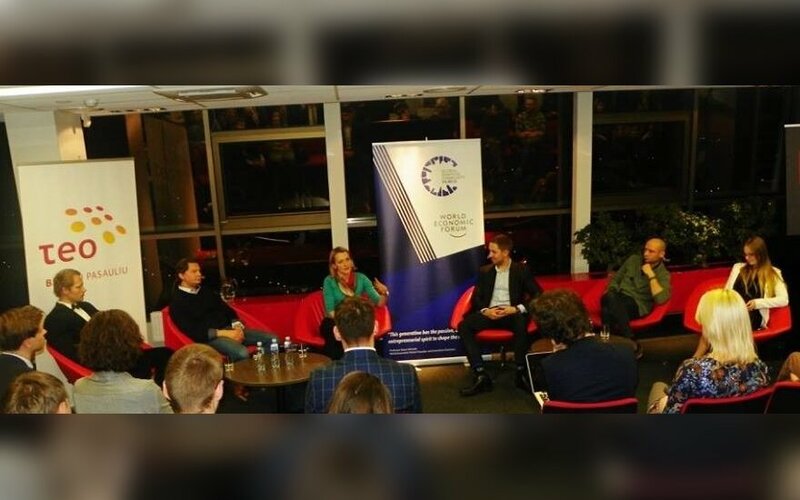 "City Alumni", a project by Global Shapers, is aimed at attracting professionals to Lithuania's regions. It seeks to bring together young professionals, who were born in various Lithuanian towns and villages, but left them, for joint activities for the good of the region and the community. In just a few months, the project brought together more than 50 communities, which includes about 300 Alumni. After registering on the website www.cityalumni.lt and collecting the Alumni community to their home town, the participants of the project have already begun to share their ideas, skills, experiences, connections. The project is also gathering a team of ambassadors. Heptathlon athlete Aušra Skujytė, EU ambassador to Russia Vygaudas Ušackas, president of the Free Market Institute of Lithuania Žilvinas Šilėnas and other public figures have joined the project.